It’s safe to say that Tom Wilson didn’t take too kindly to the headshot delivered by Ian Cole against Evgeny Kuznetsov. Call me a dinosaur, but this is why you need a player like Tom Wilson. He can not only play very effectively, but NOBODY gets to cheap shot one of the team’s stars without consequences. Kyle Dubas may not like to hear it, but in the playoffs that matters! This is the kind of event that ripples through a lineup. The Caps skate with confidence because they know Wilson’s there. And the other team is reluctant to try anything – because they know he’s there. The point isn’t about being excessively “old school”. 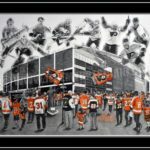 Nobody longs for the days of the Broad Street Bullies. But the game that’s played in the playoffs has little resemblance to the game that’s played right now. The list of players who put up massive points in the regular season but disappear in the playoffs is long for this precise reason. And it’s why I strongly think the Leafs need to see what they have before making any real long term decisions. You have no idea how their players will respond to later round games. Does Mitch still go to the tough areas to score? Does Matthews elevate his play? Does Muzz open the ice for the others? Is he enough for the D? Or are there other depth pieces would make the team more well rounded? You have to go through this to know. And the Leafs haven’t yet, so they don’t know, even a guy as smart as Kyle Dubas.